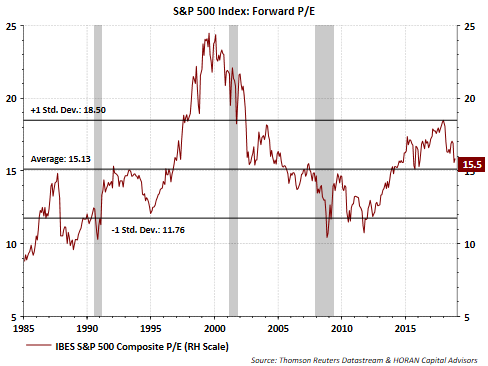 One issue strategists are highlighting of late is the fact the earnings growth rate for the S&P 500 Index in 2019 is expected to decelerate from the mid to high 20+% level this year to the mid single digit percentage level in 2019. Some have indicated this slowing earnings growth rate may negatively impact U.S. equity returns next year. Of course the strong rate of earnings growth this year is due in part to the benefit companies have received from the tax cut. In addition to the tax cut benefit though, companies are seeing top line revenue growth in the high single digit percentage level. Although earnings will remain at a higher level due to the lower tax rate, the year over year growth rate in earnings will fall back to a more normalized level next year as the earlier year comparison is a higher number. In terms of the impact on broad market equity returns, the change in the rate of earnings growth has less of an impact on index returns compared to the trend in earnings. 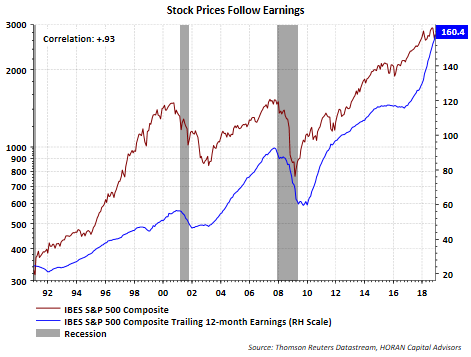 The below chart shows the forward earnings growth rate as compared to the actual 12-month realized trailing earnings. The expected earnings growth rate looking out twelve months has slowed to 8.58%. 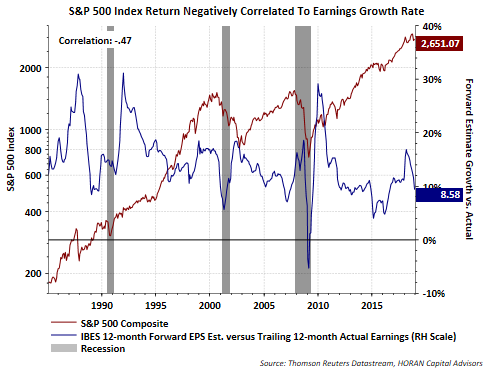 Worth noting is the fact the S&P 500 Index return is negatively correlated to the rate of earnings growth. What tends to be more important to the equity index return is the trend in earnings. The below chart shows the 12-month trailing earnings for the S&P 500 has a nearly perfect 1.0 positive correlation to the move in the Index. S&P Dow Jones Indices is projecting 2019 bottom up estimate for earnings at $174.02; thus, a similar rate of growth as noted in the earlier chart using I/B/E/S data from Refinitiv. Admittedly, it can be difficult to predict short term market direction and other factors do influence equity returns. Some of those factors include valuation metrics like P/E or P/B. And valuation levels have fallen to more average levels too. Quality factors influence returns as well, e.g., dividend yield, leverage, etc. However, in looking only at earnings, the trend would seem more important than the actual change in the rate of growth of earnings. For 2019 then, and all else being equal, in terms of the anticipated positive trend in earnings, stocks could do okay in the coming year.